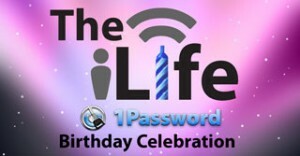 TheiLife Birthday Celebration continues with 1Password: 1 Free License up for grabs! Like free stuff? Know how to write a comment on this blog? Read on for a chance to win a free license to 1Password! In commemoration of theiLife.com’s first anniversary, developers from Agile Web Solutions have kindly provided us with one free license to their famed 1Password software to give away. For those of you who don’t know what 1Password is, you should check it out. If you browse the internet on your Mac I highly recommend you start using 1Password to save time and protect yourself from the dangers of the internet. Not only does it autofill forms and login windows but it can generate strong passwords and even sync this information securely across computers or to your iPhone or iPod touch! If you’d like to be entered to receive a free copy of 1Password, simply comment below! A big thanks again to Roustem of the 1Password team for allowing this to happen. And, by the way, happy 250th post everyone! Join in TheiLife.com Birthday Celebration: Free Stuff Abound! TheiLife.com celebrates it’s first birthday today! Join us for the festivities!! Today, October 19th marks one year to the day that theiLife.com domain was registered. In the time between October 19th, 2007 and October 28th, 2007 (the first post) was the first creation of blog. This year, to commemorate this time period, we will be giving away all kinds of great stuff to our readers. At the moment, we’re keeping the list of goodies secret, but do note by commenting, on any birthday labeled post, you will be automatically entered into our drawing. Only one entrance per person, however- yes, we will track your email and IP addresses. So keep on the lookout and feel free to comment on any birthday article for great free stuff anytime starting now until October 28th, 2008! 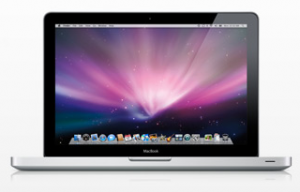 Apple is expected to release updated versions of it’s MacBook and MacBook Pro laptop models. Stick to this page for live coverage from this event starting at 10AM PST (1PM EST). Tuesday beginning at 10AM Pacific in the Cupertino campus, Apple is expected to release the latest revisions of MacBook and MacBook Pro’s. 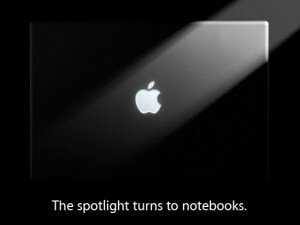 Rumors have been flying around since the start of this year about a new aluminum MacBook and a redesigned MacBook Pro. Originally rumored to take place in September, but later pushed until October, Apple issued members of the press invites last week. Since then, there have been a number of breaks in secrecy including a number of case shots and an Apple Support document. It is almost certain that Apple will be introducing new MacBook and MacBook Pro’s at this event. Stay on this page for live coverage throughout the event- as well a pictures gallery after the jump. Apple Town Hall has been the venue for the introduction of the latest generation iMac and Mac mini. 11:09AM EST The servers have been locked down and prepared for tomorrows event. T-minus 13 hours and counting. More coming soon! 1:02PM EST The event has begun. Steve Jobs has taken the stage. 1:03PM EST Tim Cook takes over to cover the state of the Mac. 1:06PM EST Talks about the Mac success over the past few years. 1:10PM EST Steve Jobs returns to the stage. 1:15PM Jon Ive takes the stage to talk about the new notebook manufacturing process. Brick? 1:16PM EST Started with a large piece of aluminum and work it down allows for stronger and lighter notebooks. 1:18PM EST Used it for the MacBook Air. Now applying it to the new Apple laptops. Jobs is again taking the stage. 1:19PM EST Apple is using new NVIDIA cards in their laptops. 9400M. 1:21PM EST Multi-touch glass trackpads. No button. 4 software gestures. 1:25PM EST New MacBook Pros that look exactly like the leaks seen last night. 1:32PM EST MacBook Pro specs: Magsafe, Gigabit Ethernet, Firewire 800, two USB ports, a Mini Display Port, Audio In/Out analog and optical digital, ExpressCard 34. Both 9400 and 9600GT. SSD option. 1:39PM EST New MacBook Air update. Now shipping with a 9400 integrated graphics card. 128SSD option. Mini display port. 1:42PM EST The current MacBook price has been dropped to $999. New model is shipping with an all aluminum case, LED backlit display and starts at $1299. 2:07PM EST That’s all. Sorry for the lacking liveblog, there were some server issues. Apple’s October 14th Event Confirmed! 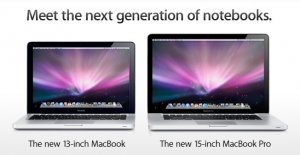 Redesigned MacBook’s and MacBook Pro’s expected! New Apple laptops are on are their way! Thursday, Apple sent out invitations to the media for the rumored October 14th event. This event is expected to contain the release of new MacBook’s. Rumors have been flying around for about 2 months that the new MacBook’s will have aluminum casing similar to the MacBook Pro’s and earlier PowerBook cousins. The event is to be held at 10:00 in Cupertino at Apple Town Hall. Apple Town Hall has been used for other special events such as the introduction of Aluminum iMac’s in July of last year. Stay tuned to The iLife for more information on the event.